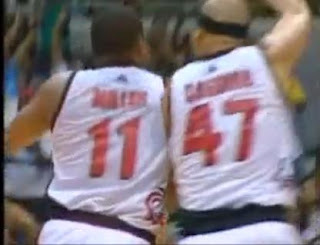 Aside from an All Star or national team game, I never really imagined Caguioa playing pointguard to Miller. But as much as I love to have Cyrus Baguio on Ginebra's roster, I cant really find enough reason to convince myself to hate Willie Miller..hate is a strong word by the way..let me rephrase that..its hard to dislike him. Ginebra's game against San Miguel beermen last Wednesday - my birthday :) - which I failed to finish, great thing someone uploaded it online - was IMO Miller's breakout game as a gin king. Together with Mark Caguioa, they both propelled a come from behind win. I was really unsatisfied of the previous trade because Baguio came out strong on the first match of Alaska & Ginebra, Cyrus even had consecutive great games as an Alaska main man. On the otherhand Miller had to slowly adjust mainly because Ginebra is very loaded on guards. The new Ginebra team is slowly adjusting with Ginebra's core players - Helterbrand, Menk & Caguioa - coming off from injuries, Hatfield from LOA(? ), new acquisitions like de Ocampo, Villanueva, Cruz, Miller. I just wish JC Intal can bring his A game again and they can find a tough, reliable import ASAP. For 2 consecutive games, Ginebra has won due to end game efforts against Barako Bull and Alaska Aces. I dont know if its a bad or good thing but a win is a win. Looking forward to another win, their next game is on Sunday versus the young guys of Rain or Shine.